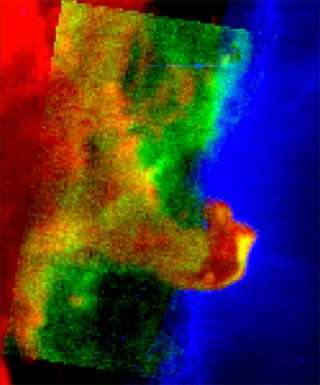 Two research teams used a map from NASA's Stratospheric Observatory for Infrared Astronomy, SOFIA, to uncover new findings about stars forming in Orion's iconic Horsehead Nebula. The map reveals vital details for getting a complete understanding of the dust and gas involved in star formation. The Horsehead Nebula is embedded in the much larger Orion B giant molecular cloud and is extremely dense, with enough mass to make about 30 Sun-like stars. It marks the boundary between the surrounding cold molecular cloud—filled with the raw materials needed to make stars and planetary systems—and the area to the west where massive stars have already formed. But the radiation from the stars erodes those raw materials. While the cold molecules, like carbon monoxide, deep within the dense nebula are sheltered from this radiation, molecules on the surface are exposed to it. This triggers reactions that can affect star formation, including the transformation of carbon monoxide molecules into carbon atoms and ions, called ionization. A team, led by John Bally at the Center for Astrophysics and Space Astronomy, at the University of Colorado in Boulder, wanted to learn if the intense radiation from nearby stars is strong enough to compress the gas within the nebula and trigger new star formation. They combined data from SOFIA and two other observatories to get a multifaceted view of the structure and motion of the molecules there. Bally's team found that the radiation from the nearby stars creates hot plasma that compresses the cold gas inside the Horsehead, but the compression is insufficient to trigger the birth of additional stars. Nevertheless, they learned key details about the nebula's structure. The radiation caused a destructive ionization wave to crash over the cloud. That wave was stopped by the dense Horsehead portion of the cloud, causing the wave to wrap around it. The Horsehead developed its iconic shape because it was dense enough to block the destructive forces of the ionization wave. "The shape of the iconic Horsehead Nebula speaks to the movement and velocity of this process," said Bally. "It really illustrates what happens when a molecular cloud is destroyed by ionized radiation." Researchers are trying to understand how stars formed in the Horsehead Nebula— and why additional stars did not—because its proximity to Earth allows astronomers to study it in great detail. This provides clues to how stars may form in distant galaxies that are too far away for fine details to be observed clearly by even the most powerful telescopes. "In studies such as this, we are learning that star formation is a self-limiting process," said Bally. "The first stars to form in a cloud can prevent the birth of additional stars nearby by destroying adjacent parts of the cloud." In another study based on SOFIA's map, a team of researchers lead by Cornelia Pabst, of Leiden University, Netherlands, analyzed the structure and brightness of the gas within cold dark regions in and around the Horsehead Nebula. This region has very little star formation compared to the Orion B Cloud or the Great Nebula in Orion, southwest of the Horsehead Nebula. Pabst and her team wanted to understand the physical conditions in the dark region that may be affecting the star formation rate. They found that the shape, structure and brightness of the gas in the nebula do not fit existing models. Further observations are necessary to explore why the models do not match with what was observed. "We're just beginning to understand that, even though we only looked at a very small portion of this molecular cloud, everything is more complicated than what the models initially indicated," said Pabst. "This map is beautiful, valuable data that we can combine with future observations to help us understand how stars form locally, in our galaxy, so we can then relate that to extragalactic research." The studies were published in the Astronomical Journal and Astronomy and Astrophysics. The Horsehead Nebula map used by both teams was created using SOFIA's upgraded GREAT instrument. It was upgraded to use 14 detectors simultaneously, so the map was created significantly faster than it could have been on previous observatories, which used only a single detector. "We could not have done this research without SOFIA and its upgraded instrument, upGREAT." said Bally. "Because it lands after each flight, its instruments can be adjusted, upgraded and improved in ways not possible on space-based observatories. SOFIA is fundamental to developing ever more powerful and reliable instruments for future use in space." SOFIA is a Boeing 747SP jetliner modified to carry a 100-inch diameter telescope.